Heartworm Disease is a serious and possibly fatal condition caused by a parasite called by its scientific name, Dirofilaria immitis. 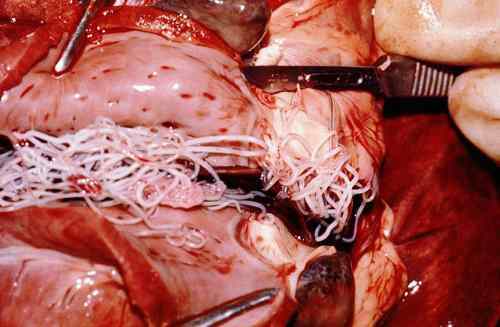 It gets its name because these parasites take up residence in the chambers of the heart and surrounding blood vessels. Adult worms resemble long thin strains of spaghetti often upwards of 12 inches long and lodge in the lungs and heart, where they begin to reproduce. Dogs, cats, ferrets can be affected. Other wild animal species are also susceptible including wolves, foxes, coyotes, and raccoons. People can be bitten by infected mosquitoes, but the parasite cannot complete its life cycle in a person. 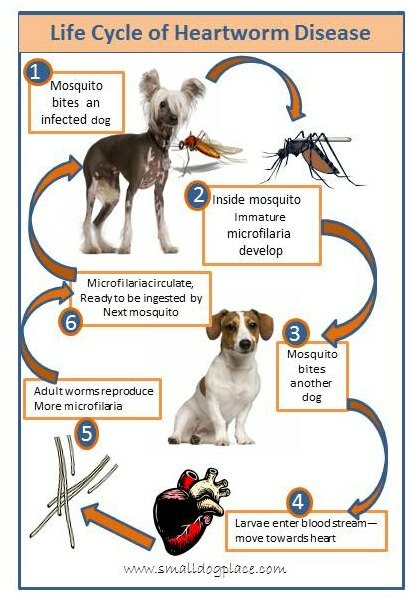 The immature stage or larvae called microfilaria (pronounced micro-fill-air-ee-ay) enter the dog’s body through the bite of an affected mosquito, grow and mature and eventually migrate through tissue towards the dog’s heart. In the heart and nearby pulmonary arteries, the sexually mature males and females mate producing more microfilaria. The adults do not attach to the heart or walls of the blood vessels, but rather feed on nutrients in the blood plasma. The microfilaria then begins to circulate in the blood stream. At this point, another mosquito can bite the animal, taking a blood meal. The microfilaria stay in the mosquito becoming infected larva. 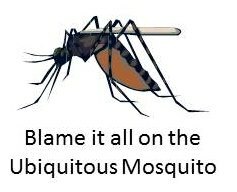 If that mosquito then bites another animal, whether it is a dog, cat or other, the disease will continue in that second animal. This entire life cycle takes approximately seven months. Adult worms, however, can remain in the dog’s heart for up to 7 years if untreated. The Heartworm microfilaria as seen under 400x magnification. Source: Wikimedia Commons. Once thought to be a regional problem in the United States occurring in warmer states, it is now found in all 50 states. Still a major problem in the southern US, the highest incidents of the disease are found in dogs that have not been on preventative medicines. The American Heartworm Society estimates that over 1 million dogs are affected at any one time with the adult heartworm disease in the United States alone. Initially, ddogs that have the heartworm disease do not show symptoms. As the infection progresses and infestation increases the dog becomes lethargic, loses weight, has difficulty breathing, and coughs during exercise. At this point, there may be a large number of adult worms living in the heart, lungs, and surround blood vessels. They restrict the blood flow which can lead to blood clots, liver or kidney failure. Dogs with severe infections can die from the massive number of small developing larvae circulating in their system. Some estimates put the number of adult worms living within a dog as high as 250. Veterinarians will be able to hear unusual heart and lung sounds. Dogs that are not treated will eventually die. Heartworm disease is treated by using arsenic type drugs that poison the adult worms and help eliminate them from the dog’s system. It usually requires that the dog remain hospitalized so that he can be monitored for possible complications such as the adult worms breaking down and clogging up arteries as they are passed. Some veterinarians may suggest outpatient treatment. Often the vet will recommend additional therapies depending on the age of the dog and the severity of the infestation. Once the treatment has begun, most of the adult worms will be killed within one to three months. Once discharged from the hospital, the dog must be kept very quiet for the next several months. Any exercise has the potential to kill the dog due to a blockage of the large pulmonary vessels around the heart. The dog is then put on heartworm preventative. Most veterinarians will recommend a yearly heartworm test, usually done at the same time as your annual physical exam. A general test called a “SNAP” test, is run in a few minutes right in the vet’s office. If technicians are available for running the test, you should have the results before you leave the office, otherwise, the vet will notify you of results at a later time. The test uses a very small amount of blood, and it is very accurate. Most people wonder why a yearly test is necessary especially if the dog is on heartworm preventative every month. U.S. Food and Drug Administration requested that the American Heartworm Society make the recommendation that veterinarians do annual heartworm testing. Most preventatives are very effective, but there is always room for human error, or dog error. For examine, a missed month or two, a dog not chewing up the medication or swallowing properly. Preventing this disease is much easier than treating it and much safer for the dog. Prevention is also much more cost effective than treating the disease. It used to be suggested that dogs receive heartworm prevention during the warm months of the year, and this could vary from state to state. Now, The American Heartworm Society recommends year-round prevention. Giving the medication year round also assures that the dog will receive worming medication for common intestinal worms some of which can cause problems for people. If dogs are treated, there is much less chance that people can become infected with those intestinal worms. To treat a full-blow case of heartworms can cost hundreds to thousands of dollars. There are several products available on the market for heartworm prevention, including the option to give daily or monthly oral meds or get injections twice yearly. All heartworm medication is either dispensed or prescribed by a veterinarian. Diethylcarbamazine is given daily and is effective against heartworms only. This is not a common treatment nowa-days. Heartgard® & Heartgard® Plus, Iverhart® Plus & Iverhart MAX™ and Tri-Heart® Plus all have the generic, Ivermectin as the main ingredient and are given once per month and control heartworms as well as intestinal parasites such as roundworms, hookworms and whipworms. 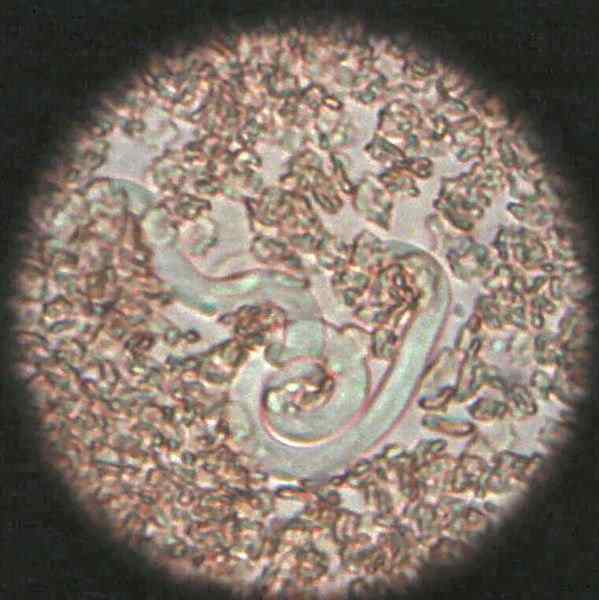 Ivermectin will kill immature heartworms in the dog the day it is given, but will not have an affect on new larvae that may be introduced into the dog the next day. Sentinel is also given monthly and is effective against heartworms and fleas. Revolution® made with Selamectin is applied topically to prevent heartworm disease. It is effective against fleas, heartworms, ear mites, sarcoptic mange and the American dog tick. Heartworm medication in the United States is obtained through prescription only. Be aware of rogue pharmacies that try to sell non prescription medications. These drugs may contain harmful substances or may provide no preventative ingredients at all. I hope your take away from this article is that you put your dog on heartworm preventative after getting him tested. As climate changes and development alters the landscape, it is likely we will see more mosquitoes and heartworm disease rather than less. Prevention, as they say is the best medicine. As a vet tech in the 70s and 80s, we saw our fair share of heartworm problems. Back then, the only preventative was a pill that was given once a day. Now, we have much easier options and the medications have improved to help prevent other parasites. Giving a heartworm preventative is a win-win situation all round.